Oh ho a bread post! Einkorn is one of the older forms of wheat that is cultivated in a domestic form to this day. This entry was posted in Bread, sourdough and tagged baking, Bread, einkorn, sourdough on 23/02/2016 by Joanna. This week I have been on a baking spree. I made Dan Lepard’s Lard Cake, recipe in the Hand Made Loaf, after several years of thinking about it, seeing Celia have such fun making it last year and after finding a butcher who would save me some good quality pork fat to render lard from. I followed the method for rendering fat in the oven which I found in Fat: An Appreciation of a Misunderstood Ingredient, with Recipes’ by Jenifer McLagen. Brian was delighted by this treat. The recipe in the book makes over a kilo of dough which is far too much for one Brian to eat even with help from me, so I split the dough into two lots and used 2 x 18 cm tins to bake them in and shortened the baking time by ten minutes. I found those paper cake cases the easiest way to line the tins and it made it easy to hoik the cakes out to cool without running the risk of burning sugar syrup going everywhere. The first one with the caster sugar topping I took to Graham at Molesworth’s, a local Bristol butchers’ shop, as he had been so kind as to keep the leaf lard back for me and was one of the few butchers I spoke to who seemed to know what I wanted so I reckoned he should get to try my first (and possibly my last ) batch of lardy cakes. The second one has a topping of Demerara sugar at Brian’s insistence as that was the way his Gran made it (as you know I never argue with Brian’s ancestors) and a few raisins. It was suggested that Brian shared his cake but apparently this is not an option. I have had a piece and I can report that it is very light, for a lard cake, but it most definitely has an aura of fine porky goodness about it, which is deeply unfashionable and will no doubt make many people rush for their kale smoothies just looking at the photos. In its favour it is of course completely dairy free and it uses a sourdough starter as well for extra fermenty goodness. The crusty sugary outside is pretty good and if I was going on a forced march over hill and dale I would be grateful to stop after about six hours and eat a chunky triangle of Lard Cake with a large mug of strong black tea, but I am not so sure I could eat this very often. I did enjoy making it though! I will try most things once, always a good principle to consider. This entry was posted in Books, Bread and tagged baking, Bread, Dan Lepard, Lardy Cake, Molesworth Butchers, sourdough on 14/03/2014 by Joanna. 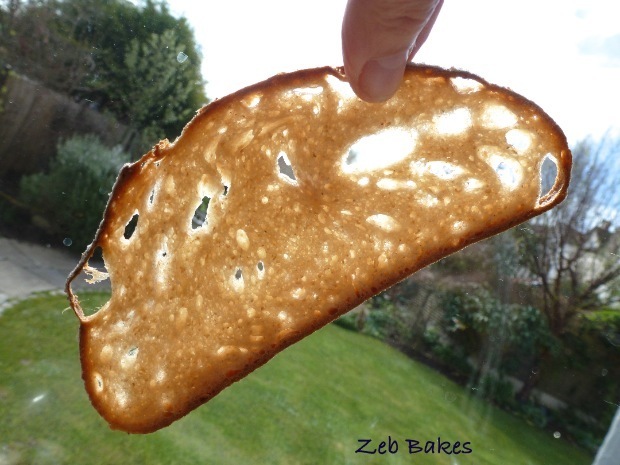 Sesame Crust Date Kefir Bread – this one gets better every time! For those of you looking for kefir bread formulae, here is what I have been up to. I mostly make the loaf you see above as we both just love it! I hesitate to call what follows an experiment because home baking is really not very scientific or rigorous as my friend Sally at the Bewitching Kitchen would probably be the first to tell you! I have no microscope or lab to tell me what is really going on in there, just a basic idea that the kefir is a mixture of yeast and lactobacteria and probably a whole bunch of other things that I don’t know are in there ! I like its tangy taste which is rich and satisfying without being overly sour. If you culture the milk at a warmer temperature than my ambient temperature which varies from around 14 – 22 C for most of the year then it does go faster, gets very active and produces quite a lot of alcohol smells. I don’t particularly want the alcohol part so I keep the kefir cool and slow. Most of the recipes for kefir bread that I have seen use some sort of sugar product to give the kefir easy food. No recipe for bread really needs sugar for yeast or levain to work, it is a choice you make because you want sweetness in the final product. Sugar in the dough promotes a deep rich colour in the crust and adds a caramel-toned sweetness to it. A sweetness that we don’t maybe register consciously but it is there. Really great bakers can get all that taste by careful selection of flours, manipulating the dough and the bake without adding sugar. I came to kefir baking via Cecilia @ thekitchensgarden.com who uses home raised honey in hers, I have been using date syrup in the preferment and this provides the kefir with a reliable and easy form of sugar food and this (as the loaf in the first picture above) produces my favourite of all the kefir breads I have made to date. I have several friends though who don’t want any sugar in their breads over and above what is in the flour already for dietary and health reasons and so I thought I would work on making the dough without any added sugars. My first attempts using my usual white stoneground flour just didn’t work well. I made a complete pig’s ear of one dough when I mixed it with all milk, thinking erroneously that this would give the preferment extra sugar. It didn’t make a nice bread, it had a dense close crumb, and the bottom crust split all round and it had that texture of cooked but spongy heaviness that I dislike in a sourdough. I have met this problem before making milk sourdough breads, so tend only to use milk as the main liquid in breads leavened with commercial yeast. If you leave a sourdough mixed with fresh milk for long enough to develop properly you get this really unpleasant sour taste, I have done that before and that is why I was pleased to find that the milk kefir can be used where fresh milk is not very suitable. It might be different with raw milk that hasn’t been pasteurized but I don’t have easy access to that here. There is such a wide range of taste when it comes to bread, I am sure some of you happily make sourdough with loads of fresh milk, but I find it unpalatable. A surprise flower in the stormy weather ! I then tried three variations of preparing a preferment and kept some basic notes as to what I saw and thought. Each of the three was made with the same quantity of active fermented kefir, and with different flour or treatment. I hypothesised that as hot water releases sugar in flour, maybe if I mixed some flour with very hot water first and then introduced the kefir to it it would find the sugar more easily and work faster. I am not sure that it made a significant difference in the end. After 24 hours it did look as if it had more bubbles, but I wasn’t really convinced. For some reason when I mix kefir with water and straight white flour the resultant preferment always ends up with that acetone/paint stripper smell that I don’t like and this proved the case this time too, so I didn’t make bread from those two as I had tried before with the acetone scented sort and didn’t like the bread it made then. This was more of a check to see if it happened again which it did. Neat way to keep track of what is going on in what bowl and a memory jogger! However, the kefir mixed with stoneground wholemeal and water produced a beery/fruity smell which Brian thought was acceptable so I built a test dough with it and baked it off. It was acceptable to us, tangy but not sour, lean and clean, without any of the butter or syrup that I usually add to our soft kefir loaves. Brian claims that he couldn’t taste much difference, but I thought the crumb was slightly less sweet and the crust was definitely not as gorgeous as when made with the date syrup. I think the kefir organisms consume most of the date syrup used in the preferment leaving very little sugar in the final dough, but one would have to have a lab to test the bread to know the truth of that, and we are all so inured to hidden sugar tastes in our food that maybe my palate just doesn’t register it as sugar. So here is a little formula to be going on with… Misky @ The Chalk Hills Kitchen pointed me towards this shortcode for recipes that WordPress now offers. Fiddly or what? What do you reckon to my first attempt at coding? Does it make it easier to read and print? It took me ages and many edits to bodge my way through this. Practice, practice…. Once mixed leave in a covered bowl while the dough is proving, the time this takes will vary according to temperature. Two short folds at intervals of approx 1 hr rather than intensive kneading are adequate to give the dough shape and structure. Susan Tenney demonstrates dough folding here for anyone who doesn’t know what this means. Shape dough and place in banetton, covered on a tray, whatever you prefer. Leave to prove for another 3 hours. Think about preheating your oven at some point. Do not expect the dough to puff up like a yeasted dough does when proving. Do a finger test to see if it is ready to bake. If your gentle prod leaves a dent that doesn’t come back after five/ten minutes then bake the bread in your preheated oven. Bake at 10 30 pm on a pre-heated tray at 210° C for 38 minutes with steam. Leave to cool on a rack. Cut when the sun shines in the early morning! For kefir grains there are sources on the internet or if you live near someone who has some just ask them nicely if they would mind sharing when they have some spare or trade something you have made or grown. It seems to be getting more popular again so they shouldn’t be that hard to source. If you have serious difficulty let me know by contacting me on Twitter, (Zeb underline Bakes) comments on posts close after a while as old posts collect spam so badly. This entry was posted in Bread, Fermentation, kefir, Learning Stuff, Recipes and tagged baking, Bread, kefir, levain, Recipe, wholemeal flour on 24/02/2014 by Joanna. The back story is that Brian eats a lot of bananas and I don’t. So if for some reason he hasn’t eaten them they sit there going browner and browner. There are always bananas lurking in various stages of decay and I try and ignore them for the most part. This entry was posted in Cakes and tagged baking, banana and hazelnut bread, Bread, cake, February Gold, frozen bananas on 07/02/2014 by Joanna.